Community groups picket Safariland- a manufacturer of police weapons in Ontario, CA. 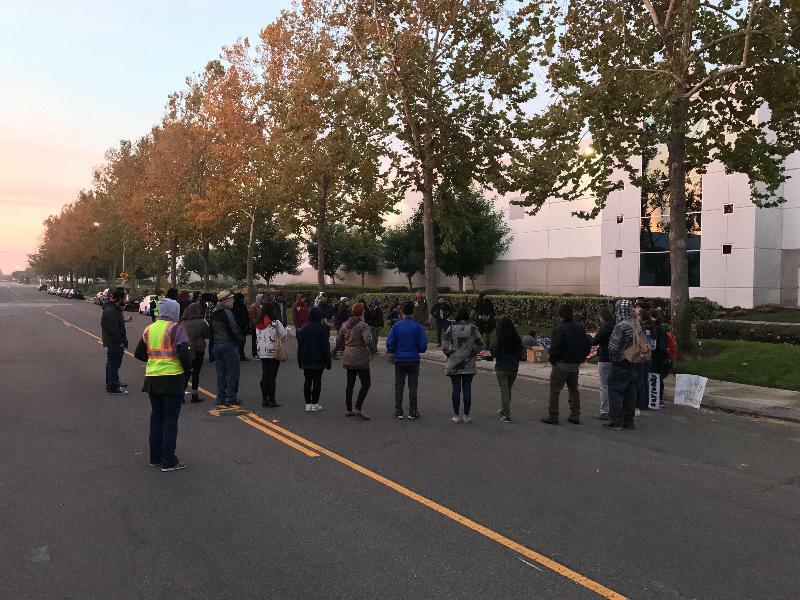 On December, 9 2016 iDrum members, community members, unionist, and students converged on the Ontario facilities of Safariland to protest the company. Safariland manufactures a wide range of weapons that are sold to the police – these weapons having been used against water protectors at Standing Rock in North Dakota. The action had various goals- to stand in Solidarity with the water protectors in Standing Rock, to bring awareness to the community of Ontario that is a housing a manufacturing plant that is complicit in police brutality, and to bring a message to the company that their practices are unacceptable and require accountability. Around 200 picketers arrived at five in the morning for the action. Around 6 as the sunrise began the action started with a praying circle where indigenous ancestors were honored and picketers were blessed. An altar was built and individuals paid their respects to their ancestors. After the praying circle an announcement was made as to what the next planned action was – to begin pickets of the parking lot entrances of Sarafiland. The group then divided in to two and started picketing with chants of “shame on Safariland,” “Water is life,” and “We can't eat oil, leave it in the soil.” Workers and staff began arriving for work at Safariland and had to choose whether or not to cross the community picket line – a picket line must always be respected especially during a strike or that person becomes a scab. 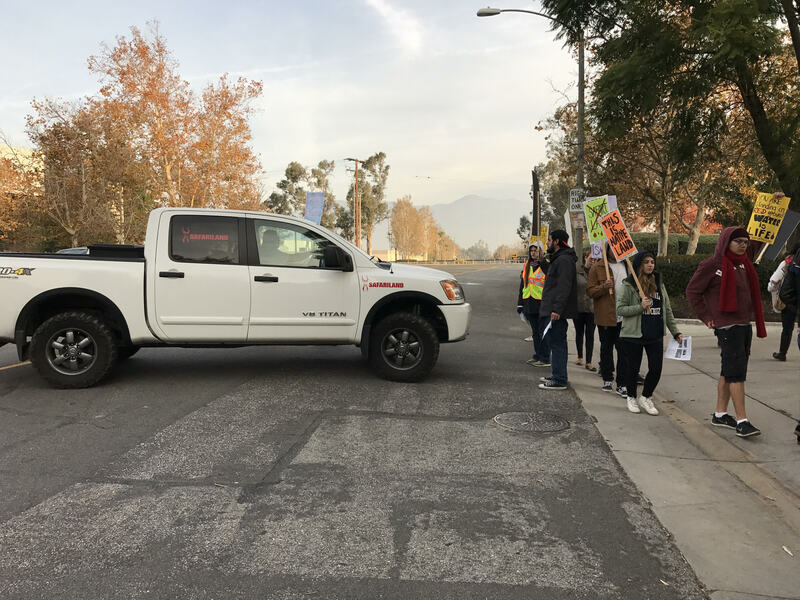 Some workers decided not to cross the picket line with their cars so they parked on the street and walked over, but before they crossed the picket line they were informed as to why the action was happening. Some staff decided to cross the picket line with their cars. The picket lines were held until 9am. Meanwhile Kelly, a Tongva sister and the brother Jag-War had musical performances. After the musical performances, a delegation was formed to deliver a demand letter to Safariland. However, Safariland locked out the delegation thus the group read the letter outside of the building using the people's microphone and proceeded to slid the letter under the door. The picketers stayed at the location until 10am and then slowly began to leave. Overall, the goal of the action was achieved. Various individuals passing by inquired about the action and they were given a flier and informed of the practices of Safariland. The workers of Safariland were also offered a different perspective of what the company they work for does. Unfortunately, Safariland was not open for dialogue so the group's grievances went unanswered; however, this is only one action of many to come. The community in Ontario has felt the effects of police brutality and this action was a very good exercise to express solidarity with those at Standing Rock that have been devastated by police violence.